It’s no surprise that the mid-range laptop market is packed with competitors from all over. 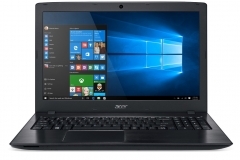 The Acer Aspire E 15 E5-575G-57D4 holds its own by offering a great value for those in search of high-end performance, but without the high-end price tag that often comes with it. Please read our full review below. Pros: Good connectivity options including USB type-C. Strong productivity performance. You can squeeze close to 9-10 hours of light work. Full HD screen. Cons: Non Touch screen. Bit bulky. It seems like everyone wants a high-end laptop, but the reality posed by a tight budget keeps most people firmly in the mid-range arena, where sub-$500 laptops are the order of the day. The Acer Aspire E 15 E5-575G-57D4 stands out as a laptop that offers many high-end features at a price point that won’t break their budgets. Sporting a fingerprint-resistant outer shell finished in obsidian black, the E 15 cuts a sleek figure in spite of its 5.27-pound weight. It’s not an ideal laptop to lug around, especially in a world where ultrathin notebooks exist. However, the E 15’s usage leans more towards desktop replacement duty with limited lugging between work, school and home. * 2.5GHz Intel Core i5-7200U Processor. * NVIDIA GeForce 940MX Graphics with 2GB of discrete Video Memory. * 1 x USB Type-C port, 2 x USB 3.0 (One with Power-off Charging), 1 x USB 3.1 Gen 1 (up to 5 Gbps), 1 x USB 2.0 Port, 1 x HDMI, 1 x LAN (Gigabit) port, Bluetooth 4.1, VGA port, DVD-Super Multi Double-Layer Drive, Memory card reader, and HD camera. Performance - Laptops in the $500 price range aren’t known for being powerhouses, yet they manage to strike an acceptable balance between bleeding-edge performance and absolute affordability. With this in mind, the E 15 offers Intel’s 7th-generation Core i5-7200U processor. Clocked at a base frequency of 2.5GHz, the two-core Core-i5-7200U isn’t a slouch by any means when it comes to everyday use, from intense multitasking to video streaming and hard-hitting usage from photo editing software. When the going gets rough, the Core i5-7200U can boost itself to a max clock of 3.1GHz to tackle CPU-intensive activities. Fortunately, all of this power doesn’t translate into a power-hungry laptop that’s constantly thirsting for juice. 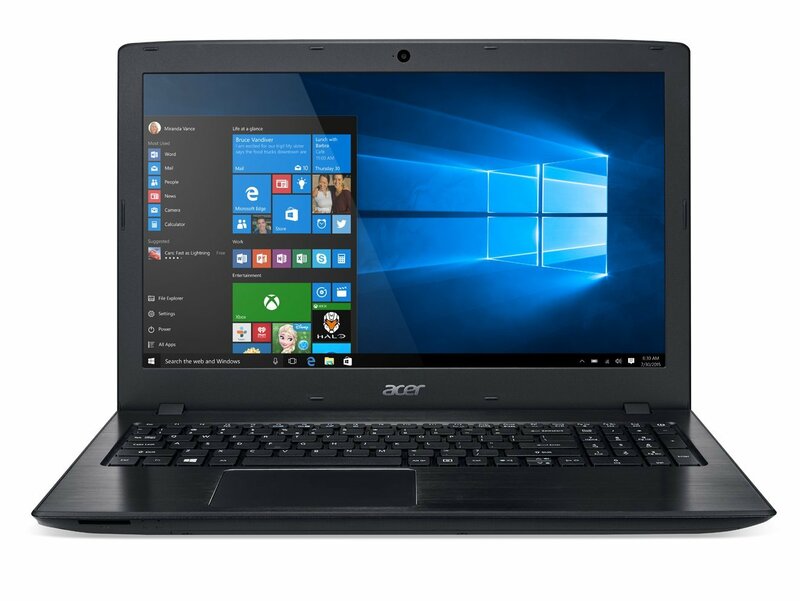 The Acer Aspire E 15’s 2800 mAh 6-cell Li-ion battery is good for up to 9-10 hours of light work (advertised 12 hours of use). Storage & Memory - A growing number of laptop makers are moving away from traditional mechanical hard drives in favor of solid state drives. Unlike their mechanical counterparts, SSDs offer substantially faster read and write times, resulting in shorter boot times and snappier program loading times, just to name a few advantages. 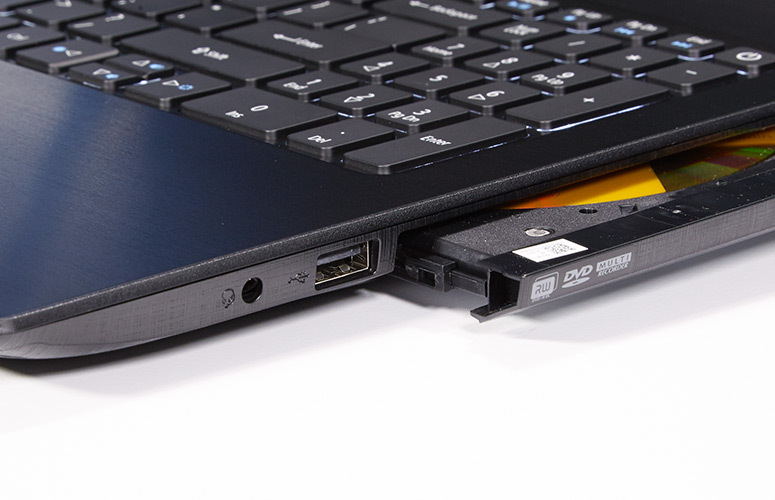 The Acer Aspire E 15 comes with a 256GB SSD, which can handily hold all of your favorite videos, photos and files. The E 15 doesn’t skimp on memory, either. 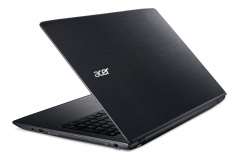 It also comes equipped with 8GB of DDR4 memory, giving the 15.6-inch laptop excellent performance for multitasking. If you need more storage or RAM, you can always swap out both for larger and more capable components thanks to the E 15’s easily accessible compartment panel at the bottom front of the laptop. 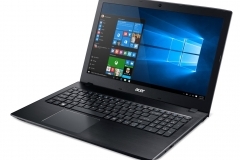 Display, Graphics & Sound - When it comes to screen size and quality, the 15.6-inch Acer Aspire E 15 fails to disappoint thanks to its Full HD widescreen display with a generous resolution of 1920x1080 pixels. The 16:9 screen ratio should satisfy movie lovers and Youtube fans, although touchscreen fans may need to look elsewhere as the LED-backlit LCD screen lacks touch functionality. Users will appreciate Acer’s BluelightShield feature, which helps reduce eye strain by cutting back the amount of blue light emissions produced by the screen. Graphics capability comes in the form of a dedicated NVIDIA GeForce 940MX graphics chipset - a definite step up from the typical integrated graphics offerings in this class. With 2GB of discrete video memory on board, this mid-range graphics chip gives the E 15 surprisingly good graphics performance for a laptop of its price range. It won’t absolutely crush the competition when it comes to frame rates, but it can handle many of the latest gaming titles with relative ease.The E 15’s sound comes courtesy of dual stereo speakers located on the bottom front corners of the laptop. While Acer’s True Harmony High-Performance Sound System strives to provide a decent audio experience, placing the laptop in your lap can easily cut that experience down to size thanks to the muffled audio. 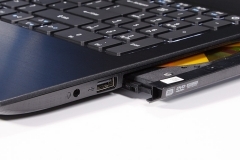 Most laptop makers are doing away with DVD drives in an effort to make their offerings lighter and thinner. The Acer Aspire E 15 is one of the few remaining laptops to buck that trend by offering a fast built-in DVD/CD drive. The E 15 is also equipped with Bluetooth and latest 802.11ac wireless, which should make streaming and file transfers faster and more reliable. 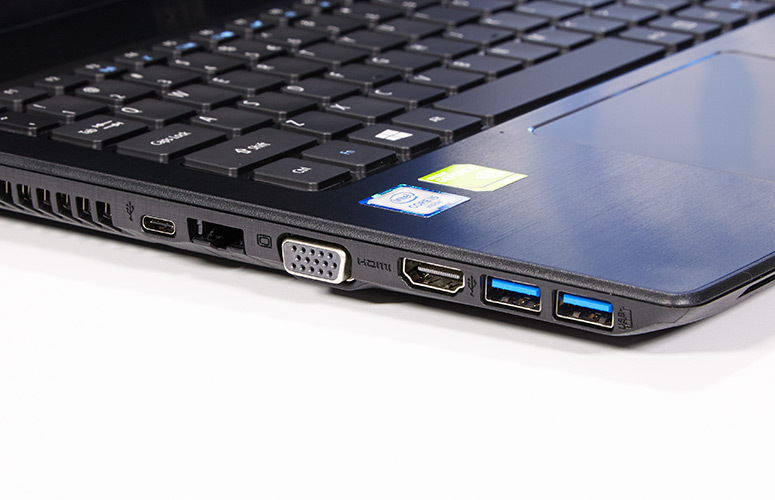 With two USB 3.0 ports, one USB Type-C port, one USB 2.0 port, an HDMI port, VGA port, SD card reader, Ethernet port and headphone output jack, the E 15 isn’t lacking for mainstream connectivity. 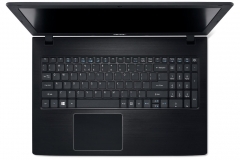 The trackpad offers an excellent amount of precision when compared to other laptops in its class. Like Apple and so many others, Acer’s following the latest trend of using the entire trackpad as a clickable space. While this gives the trackpad a sleek, unified look, the trackpad itself is a bit noisy when clicking and prone to rattles under heavy use. It’s no surprise that the mid-range laptop market is packed with competitors from all over. For instance, the Lenovo Flex 2-15 (59418271) offers a compelling choice over the E 15, especially since it offers a responsive IPS LED display with touch capability. However, its performance is hobbled by a mechanical hard drive and models that come with SSDs cost significantly more. 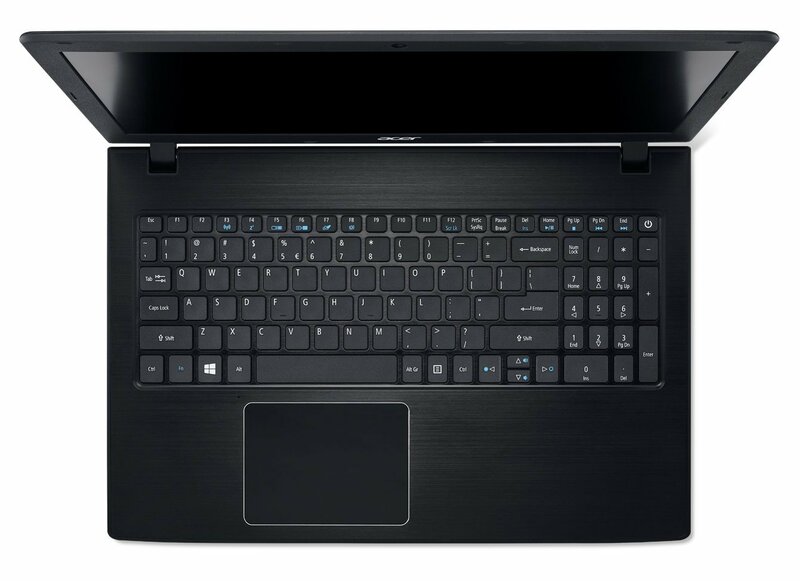 The Asus P-Series P2540UA-AB51 also matches the Acer Aspire E 15 in many respects, although it loses out when it comes to storage performance (it still uses a 1TB mechanical hard drive) and battery life (it only offers a maximum of nine hours of advertised battery life, compared to the E 15’s 12-hours). 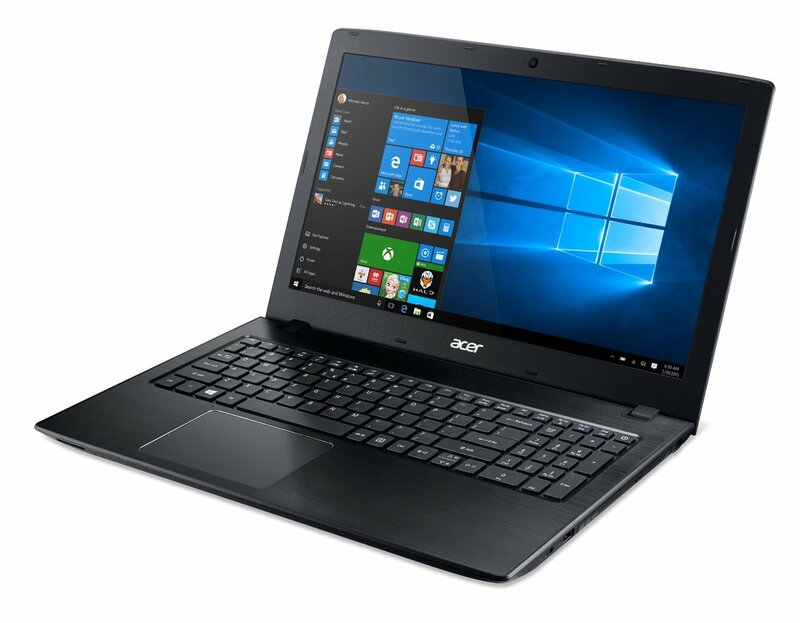 The Acer Aspire E 15 E5-575G-57D4 holds its own by offering a great value for those in search of high-end performance, but without the high-end price tag that often comes with it.